The National Instruments GPIB-PCII is a full-function, low-cost IEEE 488 interface for PCs with ISA slots. 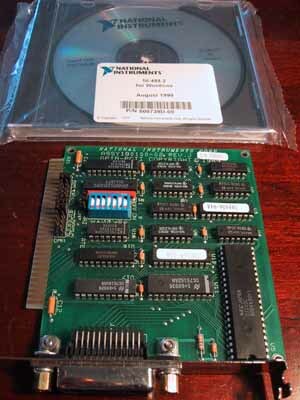 The GPIB-PCII is compatible with all NEC 5PD7210-based GPIB-PCII boards, as well as interface boards that use the TI TMS 9914A controller chip. The board can also share interrupts when used in the GPIB-PCIIA mode. The NAT4882 chip performs the basic IEEE 488 Talker, Listener, and Controller functions, as well as all the remaining Controller functions required by IEEE 488.2. By integrating the complete PC bus interface into the NAT4882, the GPIB-PCII/IIA has unsurpassed flexibility and reliability. The NAT4882 also significantly increases the throughput of the associated NI-488.2 by performing operations in hardware that were previously possible only in software.